The Buzzer blog » The Transit Network Review is back and we want to hear from you! The Transit Network Review is back and we want to hear from you! 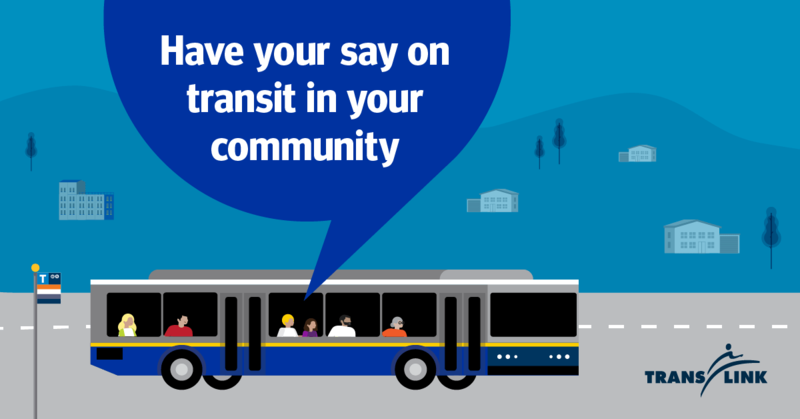 The Transit Network Review is part of an ongoing process where TransLink takes a look at the transit network to identify service changes that will better meet the needs of customers and increase ridership. With the 10-Year Vision in full swing, providing service improvements across the network in the coming months and years, we have an opportunity to deliver on more and better services for our riders, across Metro Vancouver. The last review was in 2015 where we went out to the public for extensive consultation resulting in 12,000 completed surveys leading to 85 service changes. The majority of these changes were implemented when the Evergreen Extension opened in December 2016. Now, we’re back again looking at different service areas – Silver Valley, Clayton Heights, Morgan Creek communities, as well as Port Coquitlam-South Coquitlam. Develop options to improve the 159 and 169 routes. You can get involved two ways: complete the online survey or attend one of our open houses. The survey will run from February 14, 2017 until March 6, 2017. You can find more information about the Transit Network Review at translink.ca/networkreview. Let transit get you to your Canada Day events! Kids ride free during International Walk to School Week 2015! Blanket BC’s annual “Drive on the Line” campaign is back and needs YOUR help! It’s great to see some actual expansion in the bus-service coverage area again. I’ve been getting sick and tired – as has everyone at TransLink, I’m sure! – of seeing coverage areas decreasing under “service optimization” to address crowding in the core. I won’t really comment further on the specific route changes that are proposed, simply because I don’t live in any of the affected areas and thus can’t do so intelligently. Question, though: is there any sort of an actual plan at this point for the roll-out of increased service on existing routes? Or is it going to be something that CMBC figures out sheet-by-sheet, based on how many extra drivers they can manage to hire/train and how many old D40LFs/D60LFs they can keep running past their retirement dates? Hey there, I’m checking in on specifics for the added service and affected routes. As soon as I get the info, I’ll pass it your way :) Thanks! Update! Yes, there’s a plan that’s in the works and once finalized and approved, we will be sharing to the public and of course, right here on the Buzzer blog. I’ll keep everyone updated as I learn more. Thanks! Is there anything planned for people who live around the Cottonwood area?